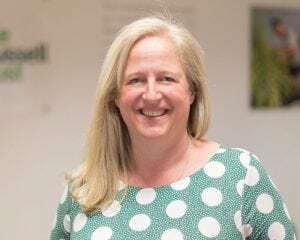 Emma Revie is the Chief Executive of The Trussell Trust, a charity that supports a network of over 420 foodbanks to provide emergency food to people in crisis, offer additional support and campaign for change. Originally from Perthshire, she has spent the last two decades challenging social injustice. Foodbanks across Scotland meet thousands of people every year – during 2017-18, over 170,000 three day emergency food supplies were provided to people by Scottish foodbanks in The Trussell Trust’s network, a 17% increase on the previous year. More than a third went to children. After single men, single mums and families with children are the most likely group of people to need a foodbank’s help. Foodbanks often meet women who have been hit by something like ill health, redundancy or an issue with a benefit payment whilst shouldering the pressures of child care, unpaid housework and care work. And whilst people are referred to foodbanks as a result of a range of pressures, there is one thing everyone has in common with the mum who told a foodbank about only having £2.20 left in her purse. Turning to a foodbank really is the last option. I know we’re not okay with this. I know in Scotland we believe no one should be left hungry or destitute. And I know talking about foodbanks can make us feel uncomfortable for that very reason – it jars with our strong sense of dignity to know people are having to turn to charity for the basics. Foodbanks are providing absolutely vital, compassionate support in communities across our country, but no charity can replace the dignity of having long-term financial security. How can we channel that anger and compassion towards long-lasting change? We don’t have all the answers yet, but we’re working on it. We’ll be stepping up our campaigning work over the next three years with a huge piece of dedicated research, because what we want to see is long-term structural changes that mean the need for foodbanks ends because people have enough money to buy their own food. As Scotland’s biggest network of foodbanks, we have a responsibility to ensure foodbanks do not become part of the fabric of our society. But we can’t do it alone. To end the need for foodbanks, we need to end poverty – we need to ensure that everyone has enough money coming in to cover the cost of the essentials. Poverty is about big structural issues that we need to work together as a nation to tackle. It’s about making sure the work people have is secure and pays fairly; making sure our benefits system provides sufficient money and support for people when help is needed; making sure any crisis support delivered by local councils to fill the gaps does exactly that. There are challenges. Over the last two years referrals to foodbanks made due to benefits not covering the cost of living are not only driving the increase in foodbank use overall – they’re also the fastest growing referral reason of all. As the rollout of Universal Credit unfolds, issues with the five+ week wait, poor administration and the way the system builds debt into people’s lives by offering loans that are often paid back at high rates, all need addressing urgently. In Scotland, we have the tools to make a difference through the Scottish Welfare Fund and newly devolved welfare powers. We have a real opportunity to prove to the rest of the UK that when you invest in crisis support, people are protected from destitution. Poverty is about where we draw the lines in the sand and say, no more. No more cancer patients at foodbanks, no more mums with only £2.20 for the next fortnight, no more five year olds turning off lights because they know their parents have to save every penny. Women – be they single mums, pensioners or hard-working people in low paid jobs – continue to be disproportionately worse off than men. Poverty is a many headed beast and we need to work together to take it down. We all have our part to play.